The cool summer wreaked havoc on my tomatoes and okra; I had a harvest, but it was very small. It totally destroyed my eggplants, I did not even get one. I was so looking forward to trying this recipe, but kept waiting to see if I would get enough okra. Finally, I decided to supplement both the okra and the eggplant with ones local farmers had better luck with than I did. Taste-wise, this is very similar to my Khoresh Bademjun – Eggplant Stew. But the approach and texture is different. This is more like the Khoresh Bademjun my sister-in-law makes. I liked this, a lot. I think I prefer mine, but when I want a change of pace, I will definitely come back to this approach. Place peeled eggplants in a colander, sprinkle with salt and let them drain for a couple of hours before cooking. Heat 1/2 a cup of vegetable oil in a large skillet over medium-high heat and fry the eggplants until golden brown. Remove and place fried eggplants on a paper towel. 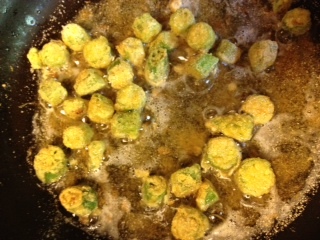 In the same skillet fry okra in 2-3 tablespoons of oil on medium heat until lightly brown. Set aside. 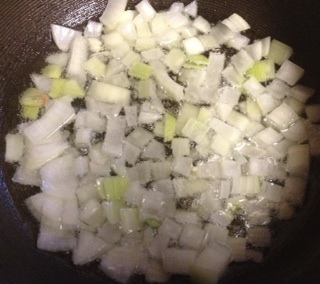 In a large stew pot saute the chopped onions on medium-high heat until golden brown. Add a teaspoon of turmeric powder. Stir well, add the minced garlic and saute for another few minutes. Add the meat, salt, pepper and brown the meat on all sides. Add the chopped tomatoes, tomato paste and add enough water to cover the meat by a couple of inches. Bring to a boil, reduce the heat, cover and cook for an hour on medium-low heat or until the meat is tender. 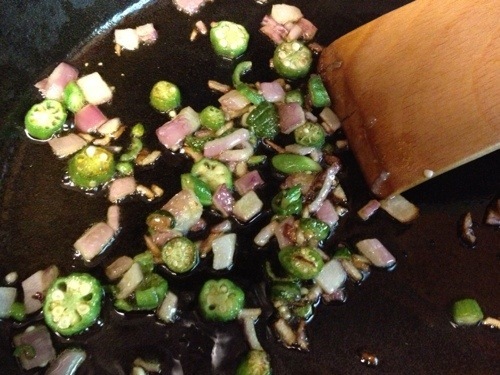 Add the lime juice to the stew, stir and gently place the fried eggplants and okra in the pot. Taste and adjust the seasoning with salt, pepper and lime juice. Add a little more water if necessary. Cover and simmer for another 30-40 minutes on low heat. To serve, gently spoon the stew in a large serving bowl. Serve hot with rice. Enjoy! I was heart-broken. 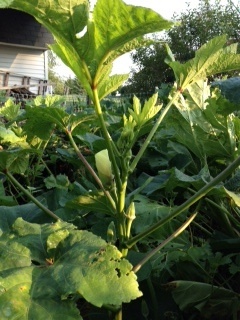 I had never seen okra plants at a garden center; I have always grown it from seed. But to my surprise, a few weeks later, when I was looking for plants to fill in some holes left by my early crops, I found 4 okra seedlings! 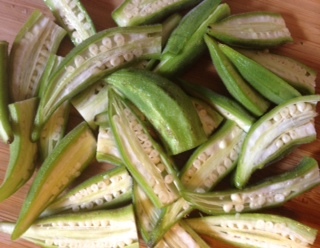 They looked sickly, but they were okra! So, I bought them, planted them and although they are not the strongest plants I have grown, they are doing OK and starting to bear fruit. So, I have my okra, and I am happy. Now to combine them with zucchini, jalapeño, and some red onion for a delicious frittata. 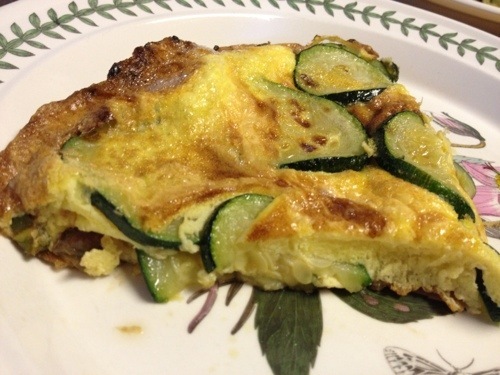 The outcome…a beautiful fluffy frittata. In a cast iron or nonstick 12 inch skillet, heat the oil over medium heat. 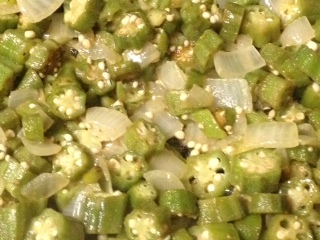 Cook okra, jalapeño and onion until tender, about 5 minutes. 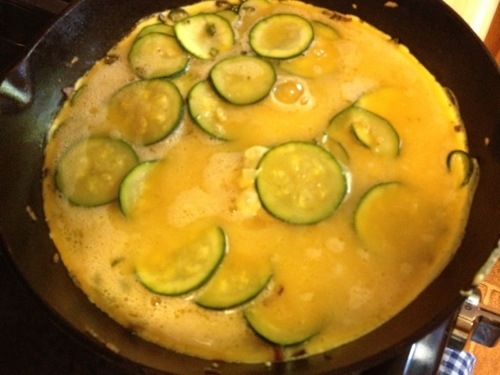 Add zucchini to the skillet and cook until tender – between 5 and 7 minutes. Season with salt. In a bowl, whisk the eggs, adding 1/2 tsp salt. Pour into the skillet with the vegetables. Cook until the sides are beginning to set, about 3 minutes or so. 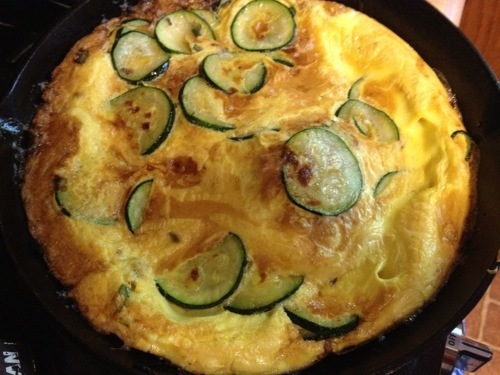 Place the skillet in the oven and broil until the frittata is just cooked through and the stop starts to turn golden brown., about 2 to 3 minutes. Do not overcook. Ode to Okra #3 is an Indian preparation – so simple and oh, so good. 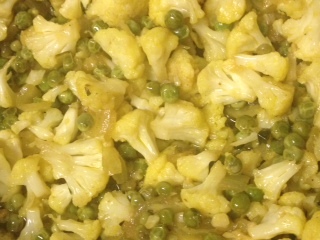 But we don’t eat that alone, there is typically another dish with it; one of my favorites is cauliflower and peas. 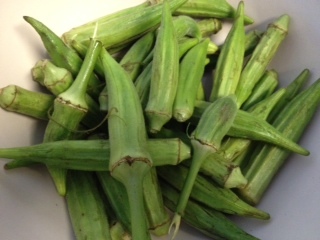 Normally the okra would be from my garden, but given the poor harvest, I did not have enough to use my own this time. 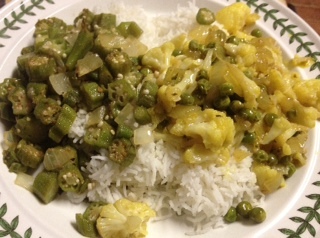 So these dishes were made with locally grown okra and cauliflower, and peas from Farmer Kim that I had frozen earlier in the spring. 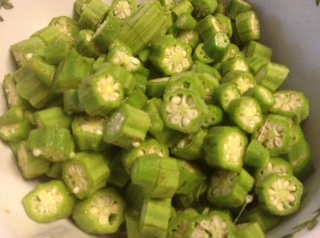 The okra can either be sliced length-wise or into rounds. I have done it both ways, but today I did rounds. 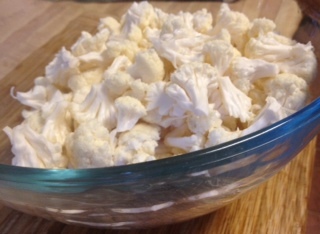 For the cauliflower dish, the cooking time can really vary based on the size of the cauliflower pieces you use. I have had it take as long as 50 minutes, but tonight it was 20 minutes. The key is to periodically stir and check the dish while it is cooking. 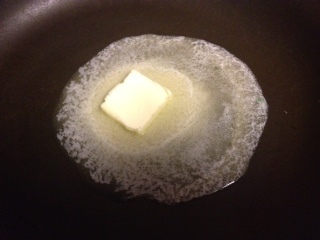 In a large skillet (with a lid), melt the butter over medium heat. Add the onion and cook until tender, about 5 minutes. Add the okra and seasonings. Cook and stir for a few minutes, then reduce the heat to medium-low, cover and cook for 20 minutes, stirring occasionally. Finish off over medium-high heat, stirring, for a few minutes. 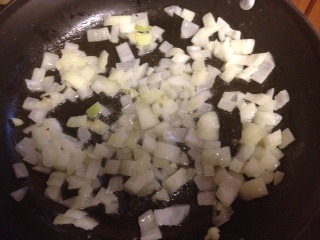 In a large cooks pan or pot with a lid, heat the oil over medium-high heat and saute the onion until tender, about 4 minutes. 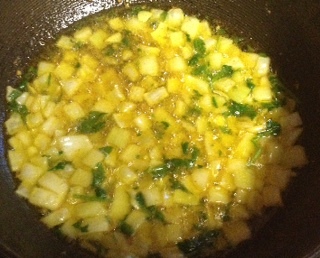 Add the garlic, parsley, and spices, cook for 3 minutes to blend the flavors. 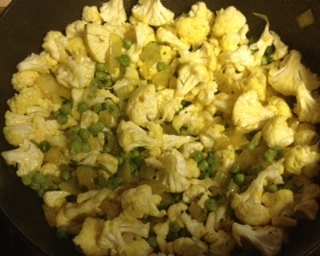 Add the cauliflower and peas. Cover, reduce heat to low ad cook for 20-50 minutes, stirring every so often, until the cauliflower is tender. Because of the damage from the caterpillars (at least I think that is who ate the leaves), I lost most of my okra plants. So the harvest is slow, although ‘pitiful’ may be the better term. But I finally have enough to do some pan-searing, so I made a half-recipe. 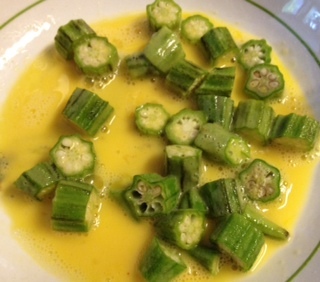 When I have more okra, I often do this without the corn, but it is great both ways. This dish was a real surprise when I first made it last year. 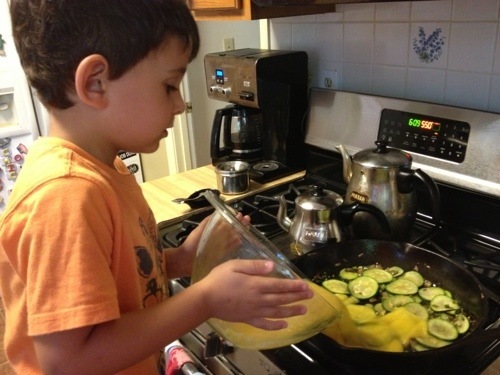 Even Cam (2 years old at the time) loved the pan-seared okra – he once ate the bowl containing all 3 servings before anyone else could get to it! A toddler scarfing down okra, who would have thought? 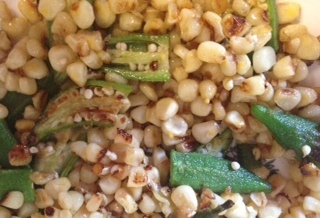 2 cups corn, cut from the cob – Since I did not have fresh cobs, I used some of my previously frozen corn. 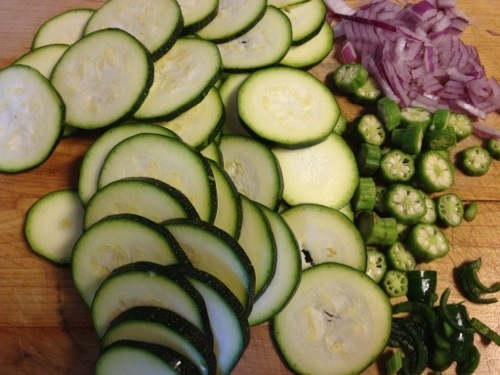 Cut the okra – I like lengthwise for this recipe. 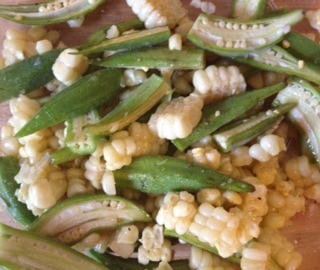 Combine okra and corn in a bowl. Toss with oil, salt and pepper. Heat a nonstick skillet over high heat. 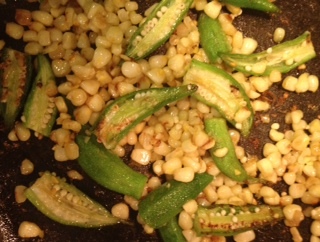 When hot add the okra and corn (leave any excess oil in the bowl). 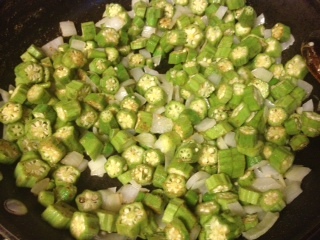 Cook without stirring for 3 minutes, then stir, flipping okra. Cook for another 3-4 minutes, til well seared. Remove to a serving bowl and adjust seasoning. Enjoy! Fast forward 20 years to my living in southern Delaware – the Northern South. Somehow I ended up with okra seeds, so I planted them in my garden to see what would happen. I was rewarded with hibiscus-like “trees” growing in my garden! Although I still did not know what to do with okra, I kept planting it just for the aesthetic of the plant. 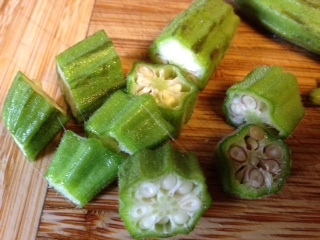 Slice okra into about 1/2 ” pieces. Beat egg in a shallow bowl. 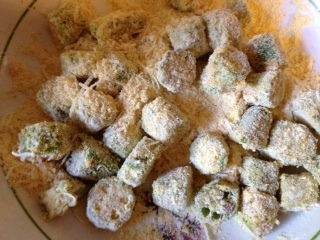 In a second shallow bowl, mix cornmeal, parmesan, cayenne and salt. 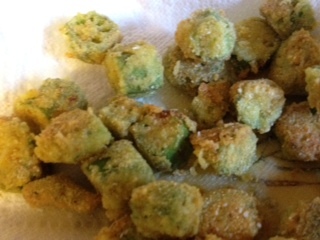 Working in batches (it took about 5 batches to do 1 lb), dip okra in egg, toss to coat. 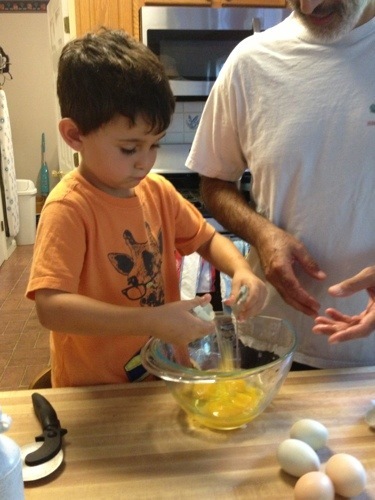 Remove from egg and toss in cornmeal mixture to coat. Shake off excess. Cover the bottom of a large skillet with safflower oil, about 1/4 inch deep. Heat over medium-high heat. 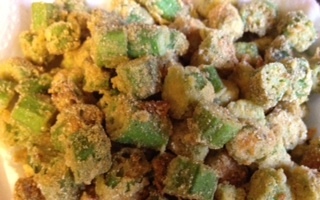 Add okra. Do not overcrowd the pan (thus the 5 batches). cook about 2 – 3 minutes, toss to flip the pieces and cook on the other side for anothe 2 minutes, til golden. Add more oil between batches, if necessary. Bring it back up to heat before adding the okra. Serve family style and enjoy!